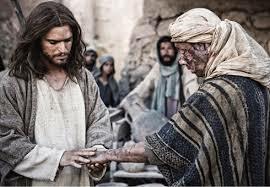 In the book of Mark we see our beautiful Lord and King healing the leper after being moved with compassion. Mark 1:39-42 NKJV 39 And He was preaching in their synagogues throughout all Galilee, and casting out demons.40 Now a leper came to Him, imploring Him, kneeling down to Him and saying to Him, “If You are willing, You can make me clean.” 41 Then Jesus, moved with compassion, stretched out His hand and touched him, and said to him, “I am willing; be cleansed.” 42 As soon as He had spoken, immediately the leprosy left him, and he was cleansed. Jesus, the Son of God, the Holy One, the King of Kings was moved with compassion! What a beautiful picture of our Jesus! A King who feels for the cast offs of society and is moved to save, heal and deliver them! A King who does not see class distinction. A King who does not wish any should spiritually perish! A King that is moved with compassion! Today let the reality of the character of Jesus sink into your heart. Ask Him to give you a heart of compassion for those who are lost, sick and bound. Ask Him to guide you in reaching out and sharing the good news with those who so desperately need to hear it! Let His love and compassion shine through you this Christmas season! ← So Heavenly minded, no earthly good?